The Prudential Center is a 23-acre complex situated in the Back Bay District between Boylston Street and Huntington Avenue. The complex contains office buildings, hotels, green space, a shopping mall, and the Prudential office tower. At the base of the tower is a beautiful shopping mall with more than 70 retails stores. The mall walkways are covered with atrium-style glass ceilings that are known as arcades. The Prudential Center, or The Pru, opened in 1965. The complex was part of a massive urban renewal wave in Boston that occurred during the 1950s and 1960s that was known as The New Boston. Architecturally, the Prudential Tower was originally considered sleek and modern, then excessively square and overwhelming, but today is an integral part of the Back Bay's appearance and culture. From the Longfellow Bridge at Cambridge Street, the view of the Back Bay is very pleasing, with the Berkeley Building standing on the left and the Prudential Tower on the right. Office towers have filled the space between them over the years, with the taller structures embedded or planted into the shorter and older brownstone residences of the historic Back Bay. The original 1960s concrete plaza, characteristic of a giant empty plateau over Boylston Street, was completely replaced in the 1990s to create the beautiful Prudential Center shopping mall. Glass covered arcades connect different portions of the complex. The Boylston and Newbury arcades are located near the Boylston Street entrance. The Prudential and Back Bay arcades intersect in a central court. The mall is joined with the Hynes Convention Center and Copley Place via walkways and passages, which is extremely convenient. There is also a public garden near the central court, where free concerts and events take place during summer. There are many points of interest in or near the Prudential Center, including the Prudential Skywalk, an observatory on the 51th floor, and Top of the Hub restaurant on the 52nd floor of the central tower. Copley Place is next to Copley Square, where Trinity Church and the Boston Public Library are located. During the New Year's eve First Night celebration, the Hynes Convention Center and Copley Square are major venues for exhibits and performances. Just to the west of The Pru is Kenmore Square and historic Fenway Park, to the east is the Public Garden, Cheers Beacon Hill and Boston Common. One block north is the Newbury Street shopping area. The Prudential Center food court is a very popular place to commence an afternoon of shopping in the mall, and then visit other nearby attractions. Walking Directions: Exit the station, Prudential Center is located just north of the station. 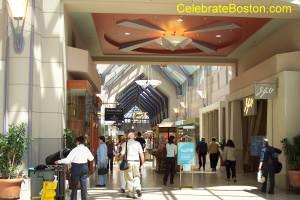 Go to the Huntington Avenue Arcade which has a large Art Deco canopy covering the sidewalk. Hynes Station (B, C, or D Trams) on the Green Line is an alternative subway stop for visiting The Pru.